As you might have guessed from the title of this post, this is my annual "new year's resolution" post. Actually, now that I think about it, I've never put my resolutions out into the universe before (in writing!) so I guess you could say this is the FIRST annual resolution post! Goal: Something you are trying to do or achieve. So while my resolution might be: Become a stronger runner; my goal might be: Lift weights at least 5 times a month. See the difference? I've thought a long time about what I want to get out of this year. I'm not a huge goal-setter. When it comes down to it, I think I fear that if I make goals and don't achieve them then somehow I've failed and I'm worthless. This happened for years and years and was one of the biggest obstacles I faced in losing weight. But I don't want to come into this new year with no resolutions or goals. There are things I'd like to accomplish- both personally and professionally, both with running and overall fitness. When I have set a goal in the past (i.e. Dopey Challenge 2014), I know how incredibly rewarding it can be to actually achieve it. So with that, here's what I'd like to do, find, complete, experience and HOW I'm going to do, find, complete, and experience it in 2016! - Lift weights at least once a week. - Incorporate at least one "sprinting" interval run into my training each week. - Sign up for a yoga class and attend. - Find a training plan that will help me achieve a sub-30 minute 5k. - Target a few races in the spring and/or fall to try and PR (currently 31:28). - Schedule training runs with people that are faster than me. Blog more frequently and consistently. - Carve out time each week to blog. - Start race recaps the week or the week after the race. - Spend time writing about things that make me excited to write about them. Maintain my weight between 140- 145. - Continue attending WW meetings each week as a member. - Track each and every day each and every thing I eat. - Reach out for help from my support system when I need it. - Invest in hobbies outside of work and working out. - Focus on efficiency at work so there aren't loose ends to work through at home or on the weekends. Be less connected AND more connected. - Establish social media "no zones"- both times and places. - Be present with people when I am with them- no mindless phone scrolling. - Turn off push notifications on my phone from social media. Start "forever" with the most handsome dude in the world. 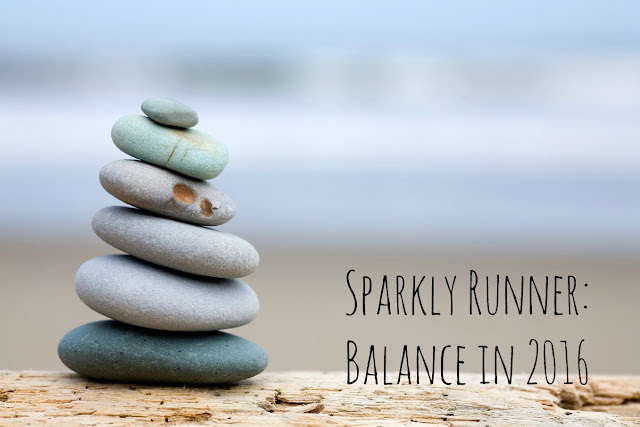 In addition to these resolutions and goals, I want to center my 2016 around one word: BALANCE. In all things that I am spending energy on, I want to make sure that I keep balance in mind. I tend to get a little obsessive over things I'm excited about- and that slight obsession can keep me from getting other things finished or keep me from experiencing all parts of my life equally. If I let one part of my life (running, WW, work, blogging) become my entire life, then the other parts can suffer. For example, when all I do for my running is well, running, then I tend to suffer injuries. When I am balanced and incorporate other activities into my training, the results are so much better. This is true for all of my resolutions and goals listed above- 2016 is the year I will seek balance in all areas of my life. What are you seeking in 2016? How will your goals help you get there? I am so excited to marry Matthew! It is easily what I am MOST looking forward to about 2016 :-) And I am super guilty of looking at my phone when I really don't need to be- getting up in the morning, while I'm getting ready, etc. I am going to make a strong effort this year to do less phone scrolling and more "in the moment" engaging with people. Happy New Year!